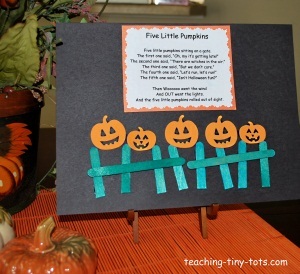 Toddler Activities: Five Little Pumpkins, a classic Halloween poem. 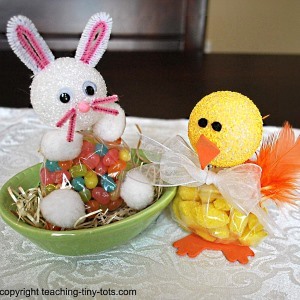 Learn the hand motions and make a cute project. Free Printable Five Little Pumpkins Poem and hand motions to go with it. Glue the vertical pieces for the fence and then one long horizontal piece on top. Craft glue will dry faster and stronger. Cut out foam pumpkin shapes. Draw on faces with a black sharpie pen. Or use pre-cut foam pumpkin stickers available at most craft stores or in craft sections. Glue or stick on if using stickers, five pumpkins on the fence. Print out the poem and mount onto paper. Keep the bottom portion with the suggested motions for reference when teaching your child the song. Find some Halloween foam stickers to add more details to the picture or make your own shapes with foam. Some suggestions are bats, leaves for the pumpkins, and cats. As a classroom activity, pre-cut construction paper pumpkins and have the children draw their own faces using crayon, colored pencils or markers. Show a few examples on the board and talk about different shaped eyes nose and mouths to help stimulate their imagination. 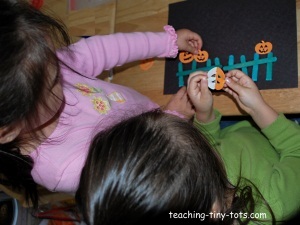 For preschool, make a larger version using uncut craft sticks and larger pumpkins. Write out or enlarge poem for all children to be able to view. Read a Halloween story about a pumpkin or a non fiction book about pumpkins. Have your child count the number of pumpkins and sticks to be used. For fun, give each pumpkin a name or have your child tell you a simple sentence about the pumpkin and write it for him or her on another sheet of paper.